Parakeets are distinguished by their long tails and hooked bills and include a wide variety of species from all over the world. From small to medium parrots to budgerigars, in many beautiful colours, they provide joy to your home with their highly sociable and intelligent nature. Due to size variations, it is difficult to specify how much room your bird will need. Always remember that bigger is better when it comes to choosing the right cage or aviary. Ensure they have enough space to fly freely from perch to perch, whilst accommodating their long tails. For a pair of small parakeets, a minimum size requirement of 30x30x30 inches is a good starting point. Parakeets love a home well-accessorised with toys. Bells, swings and puzzles provide hours of entertainment and stimulation, especially when rotated around the cage frequently. Including chewables provides exercise for their strong jaws. Perches are essential, and natural woods, such as maple or oak, are best. Your birds will enjoy stripping the bark with their beak, and they are beneficial for maintaining good nail and feet health. These inquisitive and active characters enjoy climbing. Choosing a cage with horizontal bars and hanging food and drink containers from the sides will provide more opportunities for them to do so. Choose somewhere well-ventilated and safe from direct sunlight, drafts and other pets to position their home. Placing the cage at eye level or above will give your birds an extra sense of security and comfort. 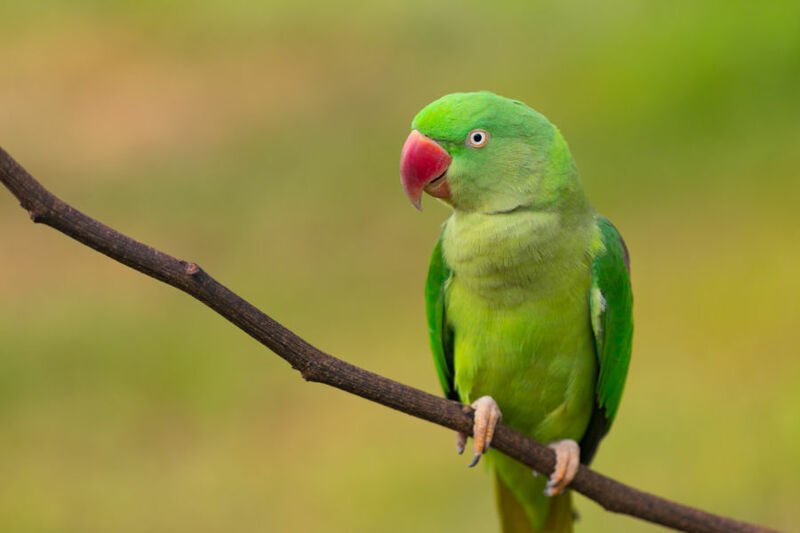 Parakeets are sensitive to odours and fumes, so it’s best to keep them out of the kitchen. Good quality seed mixtures should make up 75% of your parakeet’s diet. On top of this, providing organic vegetables, such as leafy greens, on alternate days will ensure they get the variety and nutrition they need. Chopped up fruit, such as bananas and melon, is a perfect weekly treat. It is always worth double checking the suitability of fresh foods, as some, such as avocados, apple seeds and mushrooms, can be surprisingly harmful. A cuttlebone adds extra calcium to your bird’s diet. Always make sure there is drinking water available too, which should be refreshed daily. Parakeets can become very tame, much to the joy of their owners. Communicate with your birds for at least half an hour each day, by talking and gently handling. Ideally allow 3-4 hours of free flying on a daily basis, in a safe and supervised environment, free of pets and other dangers and with windows and doors closed. Good hygiene is essential for keeping Parakeets healthy. These birds love to bathe and will enjoy the addition of a clean, shallow dish of lukewarm water to their cage, or a gentle misting above their heads using a spray bottle. Always keep their home clean, cleaning and refilling all food and drink containers daily, as well as regular replacing of the ground covering. A regular deep-clean of the cage, using a mild, bird-friendly soap, is also essential. Keep an eye out for signs of illness in your birds, including behavioural changes or change in droppings. Contact a specialist for further advice if you have any concerns. You can also contact us for further information, and to answer any further birdkeeping queries.